Dr. King's philosophy was one of non-violence, and this article looks at the alternative views of Malcolm X which are not aired quite so frequently. Dr. King is probably remembered as the most famous African-American leader in US history. At the time of his assassination in 1968 he was at the forefront of the civil rights movement in the US. He left behind him a legacy of committed, non-violent resistance to an unjust system. But perhaps his greatest legacy is his aspiration for a future in which racial division would be a thing of the past: his famous dream. Malcolm X. He was similarly assassinated three years before Martin Luther King. Although his approach to the problem of institutional racism in America was an essential component of the civil rights struggle, we hear much less about his ideas. Whenever Malcom X is brought up it is first necessary to dispense with the inevitable accusations: yes, Malcom X was - for a time - a so-called ‘racist in reverse’. He once believed in an exclusionary form of Islam, believing that the white man was the devil. This did not refer to some white people, or to most white people, but to ALL white people. But Malcolm X changed his views on that score. Indeed, his entire life was marked by his willingness to alter his views. He made many remarkable changes throughout his life, moving from a life of armed robbery, gambling, and dealing in cocaine and marijuana to an ascetic life as a devout Muslim. And by the time of his return from visiting Mecca in 1964, he had changed his views on white people. His travels through the Middle East and Africa had led him to learn the error of his racist views of whites. In a dramatic turnaround, he wrote an open letter for distribution to the press in which he rejected his earlier racism. He still believed in his struggle to fight for the emancipation of his race, but no longer believed that all white people were his enemies. Of course, the reality of 1960s North America was that many whites were the enemies of black people. And both Malcolm X and Martin Luther King were struggling to change the situation, so that African-Americans would not continue to be the victims of America. Their methods and views were very different. Dr. King was a Christian minister, whereas Malcolm X not only became a Muslim in a jailhouse conversion, but had a history of hostility towards Christianity. One of the most powerful images in Spike Lee’s biopic of Malcolm X is of Denzel Washington, as Malcolm, arguing in jail about the colour of Jesus’ skin. He was arguing that Jesus was born in a part of the world where the indigenous population had historically been ‘people of colour’. He later moderated his criticism of Christianity, and was willing to work alongside black Christian leaders, but - similar to a Marxist view of religion - he always felt that black people in America had been kept passive by Christianity since the time of slavery. They would tolerate hell in the present because of the promise of heaven in the hereafter. One of the most interesting differences between the philosophies of the two men, and one which is pertinent today given the imminent 1916 celebrations, is their attitude to violence. Martin Luther King espoused a ‘turn the other cheek’ philosophy, whereas Malcolm X had a philosophy of “vigorous action in self defence”. These two philosophies were juxtaposed in another Spike Lee film, ‘Do the Right Thing‘, which finishes with a quote from each man. However, Malcolm X did not believe in violence in all crcumstances, and generally spoke about violence as a defensive mechanism rather than as aggression. He suggested that black people should form rifle clubs. It should be remembered that gun ownership was entirely legal, and that this was in a context where the Ku Klux Klan were very active, and civil rights legislation had yet to be enacted. "They're violent in Korea, they're violent in Germany, they're violent in the south Pacific, they're violent in Cuba, they're violent wherever they go. But when it comes time for you and me to protect ourselves against lynchings, they tell us to be nonviolent" (Detroit, Feb 14th 1965 - 8 days before his death). 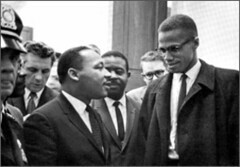 It is important to remember, as noted in Malcolm’s eulogy by actor Ossie Davis, that Malcolm X was never personally associated with any violence himself. His view was that a black population that was willing to defend itself would make for a more peaceful society, as they would be less likely to be the victims of attack. It was also clear that the government was failing to protect the black community, and Malcolm X believed that a proactive African-American policy of self defence would force the government to step in and do its job. Malcolm X saw the futility of trying to change the system from within, and in appealling to the government for change. He believed in taking action to improve circumstances of discrimination or oppression. He spoke about a 'do it yourself philosophy, a do it right now philosophy, an it's already too late philosophy'. He knew that African-American people could not achieve fairness in the system of the time, and this was the reason for his militancy and urgency. But he was also conscious that his militancy would make the more moderate path of Martin Luther King appear more acceptable in comparison. At a speech in Jan/Feb 1965 in Selma, Alabama, where King was in jail, Malcolm X spoke at a rally and sat beside King's wife on the podium. Dr. King's wife told ‘Jet’ magazine that Malcolm X told her that he "wanted to present an alternative; that it mght be easier for whites to accept Martin's proposals after hearing him (Malcolm X)... He seemed rather anxious to let Martin know that he was ...trying to make it easier [for him]" (cited in Alex Haley's introduction to The Autobiography of Malcolm X). So in his militancy, Malcolm X was also consciously attempting to open up a space for more moderate voices to be heard. Malcolm X's approach was an essential component of the civil rights struggle, and I believe that his commitment, his militancy, and his unwillingness to compromise or be co-opted mean that his ideas have far more emancipatory potential than those of Martin Luther King. Malcolm X died while his ideas were still developing - who knows what solutions he would have come up with if he had been allowed to live?